New "La mort sera belle" CD is now available. New "Terreur et Tourment" LP is now available. 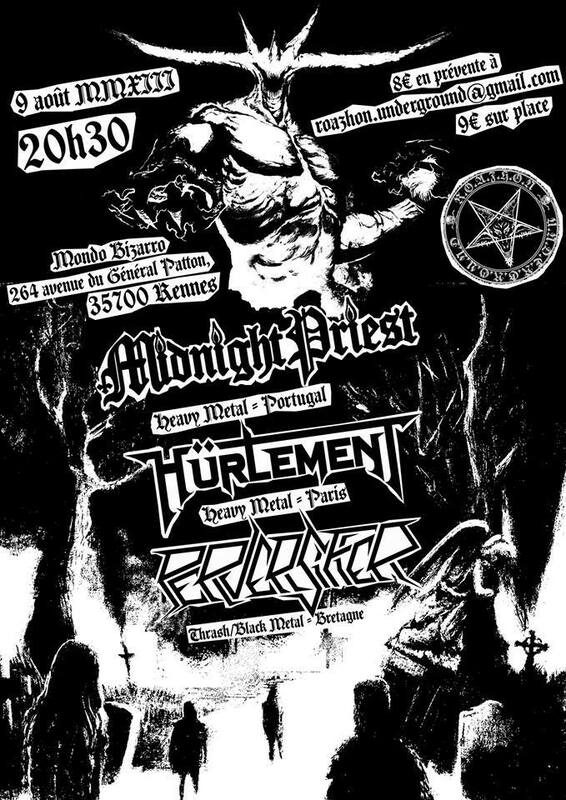 New show August 9th at the Mondo Bizarro in Rennes (France) with Midnight Priest and Perversifier. New show October 27th at the Klub in Paris (France) with Chariot, Dream Catcher and Evolvent. 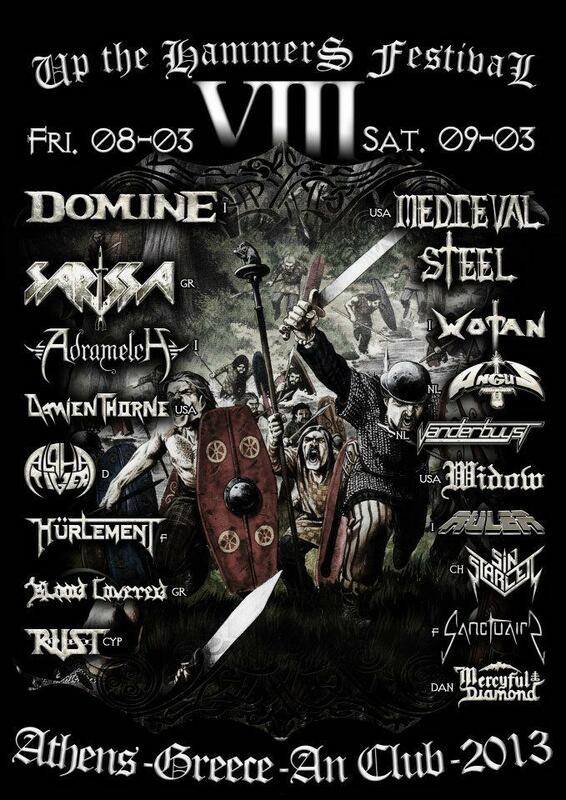 Hürlement will play at the Up the Hammers Festival VIII, 8th March 2013 at Athens (Greece). "Dogue de Brocéliande", third song from our upcomming album "Terreur et Tourment" is now available in Media section! "Brothers of the Watch", second song from our upcomming album "Terreur et Tourment" is now available in Media section! "Inquisition", the first song from our upcomming album "Terreur et Tourment" is now available in Media section! 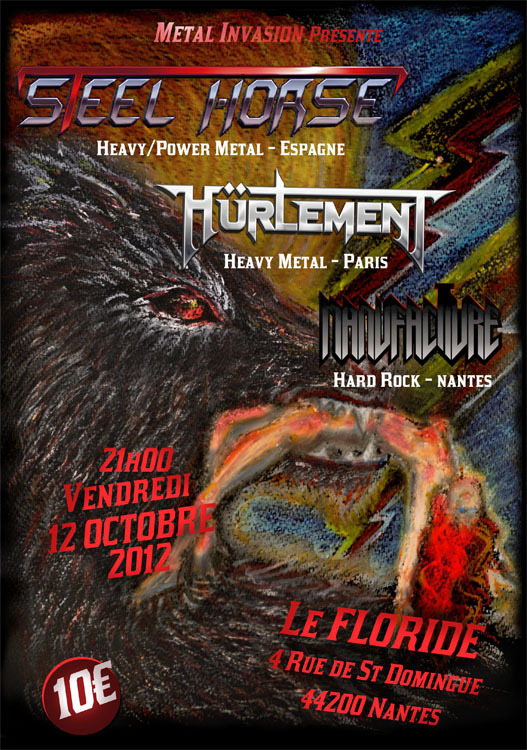 New show October 22th at Le Floride in Nantes (France) with Steel Horse and Manufacture. 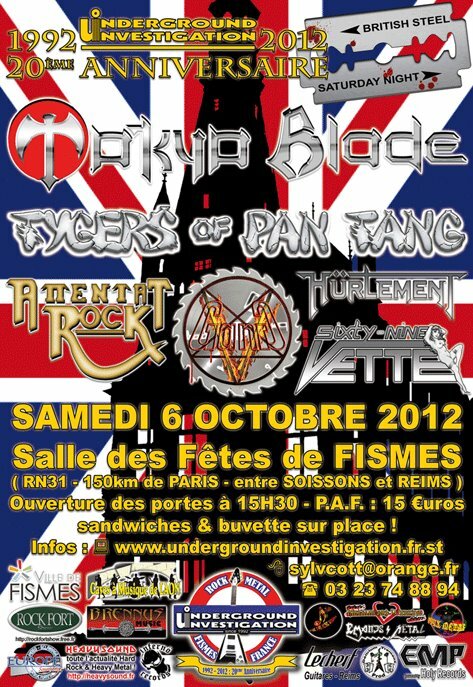 New show October 6th at Fismes (51 - France) with Tokio Blade, Tygers of Pan Tang, Attentat Rock, Gang, and Sixty-nine Vette. 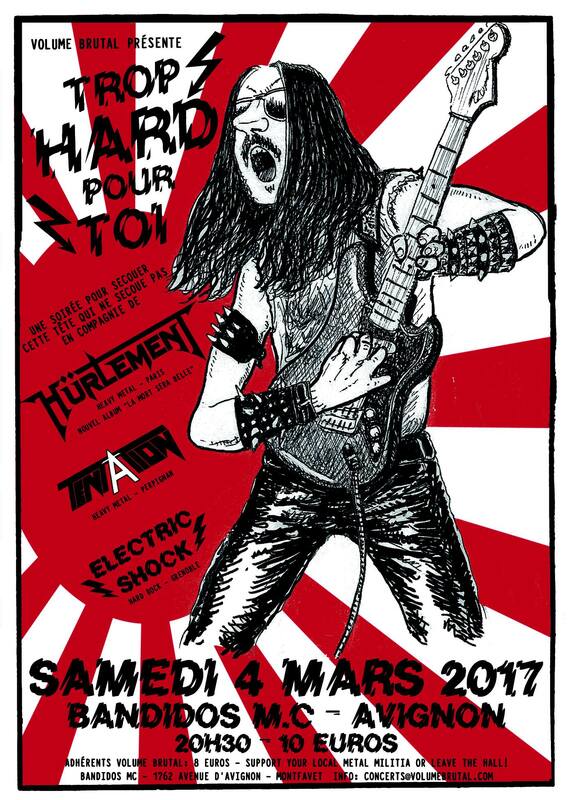 New show March 3rd at Ponson Dessus (64 - France) with Killers, Evil One, Les Gaulois (redonnent vie au Destropouilaves) and Bias. The Keep It True, The Underground Kodex Vol.1 compilation (with a Hürlement unreleased song) has been added to our merchandising. 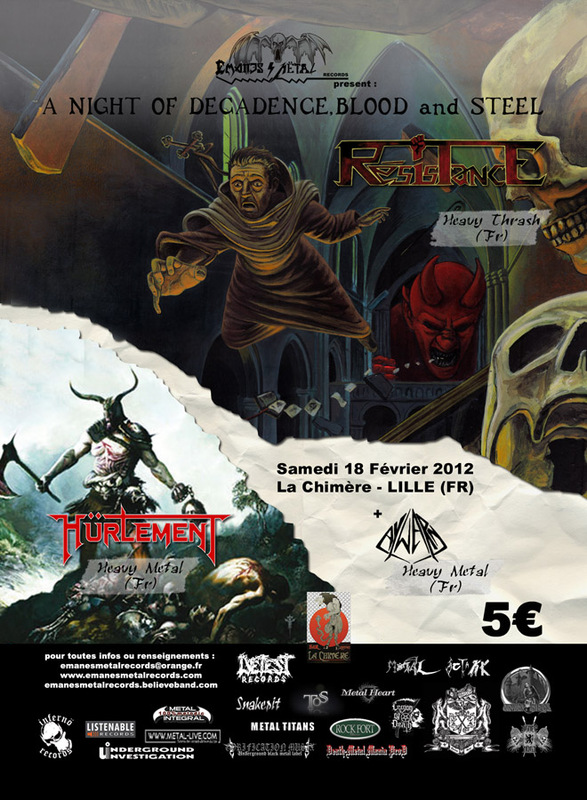 New show February 18th at La Chimère in Lille (France) with Résistance and Aywarn. 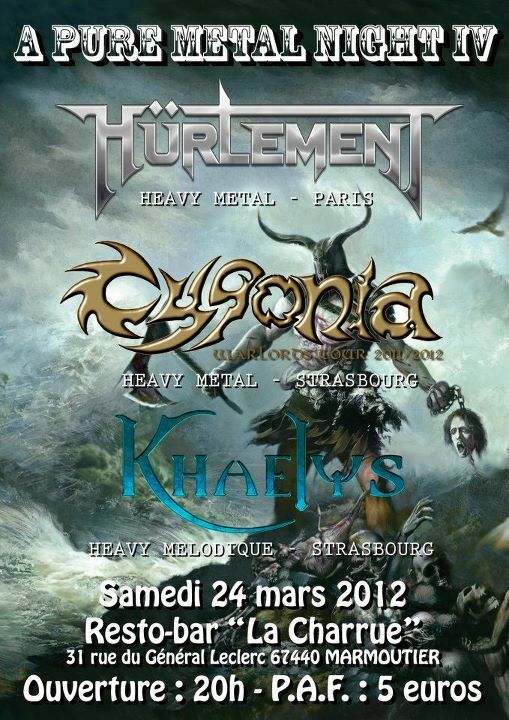 New show March 24th at La Charrue in Marmoutier (France) with Cygonia and Khaelys. 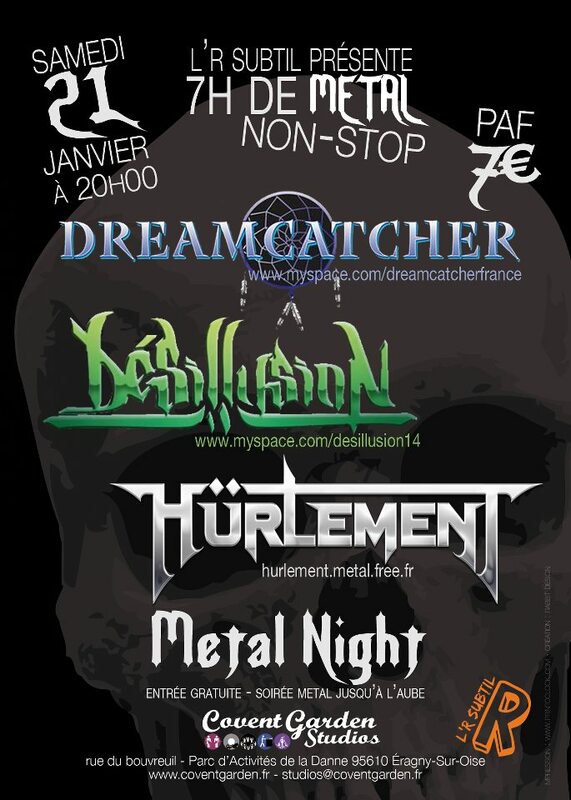 New show January 21 at the Covent Garden Studio in Eragny (France) with Dreamcatcher and Désillusion. New show February 19th at le Klub in Paris (France) with Square. 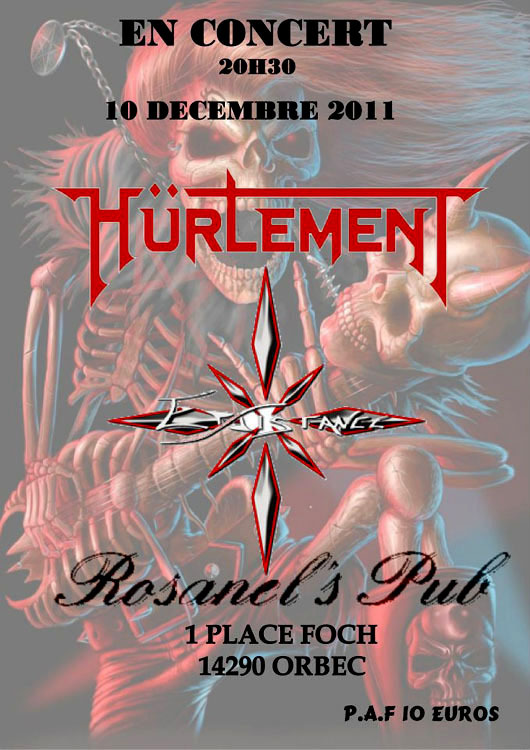 New show December 10th at the Rosanel's Pub in Orbec (France) with Existance. 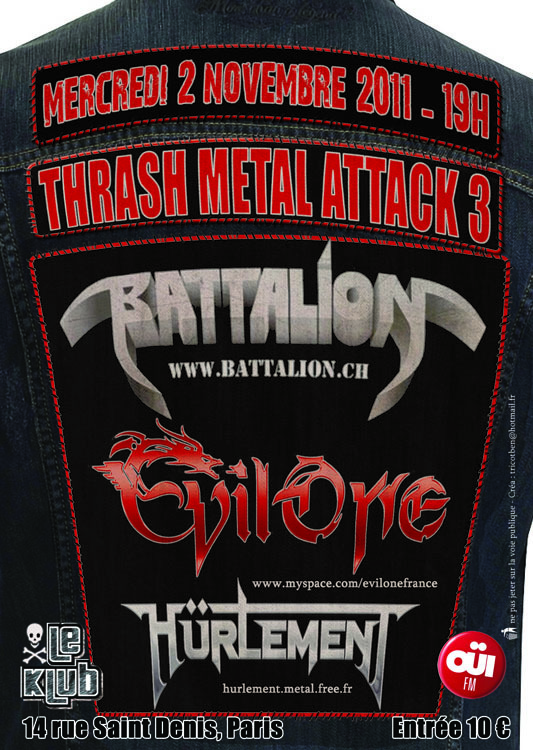 New show November 2nd at le Klub in Paris (France) with Evil One and Battalion. 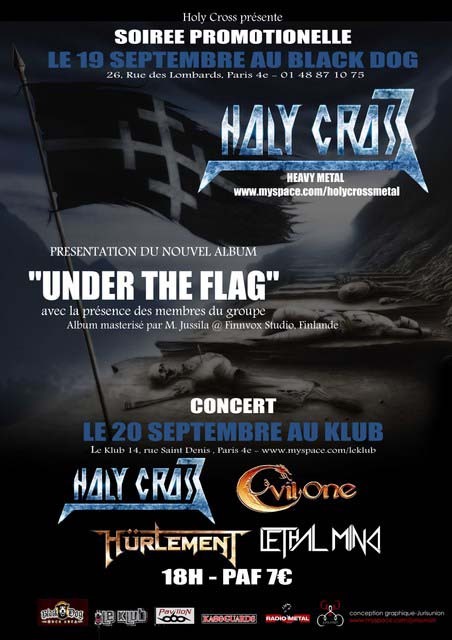 September 22nd show at le Klub in Paris (France) is cancelled ! 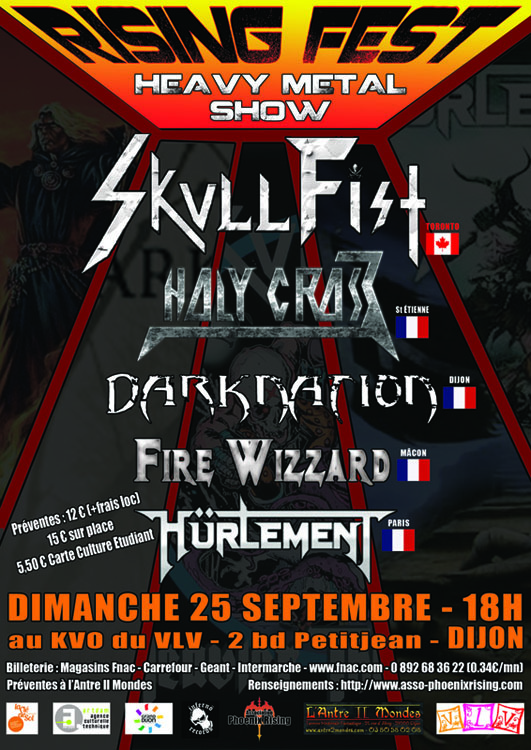 New show September 25th at Kvo du VLV in Dijon (France) with Skullfist, Holy Cross, Darknation and Fire Wizzard. New show September 22nd at le Klub in Paris (France) with Evil One and Holy Cross. 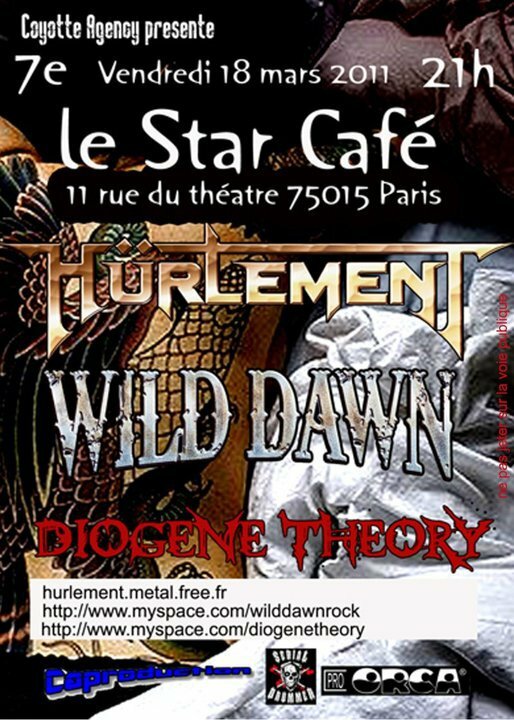 New show March 18th at le Star Café in Paris (France) with Wild Dawn and Diogene Theory. 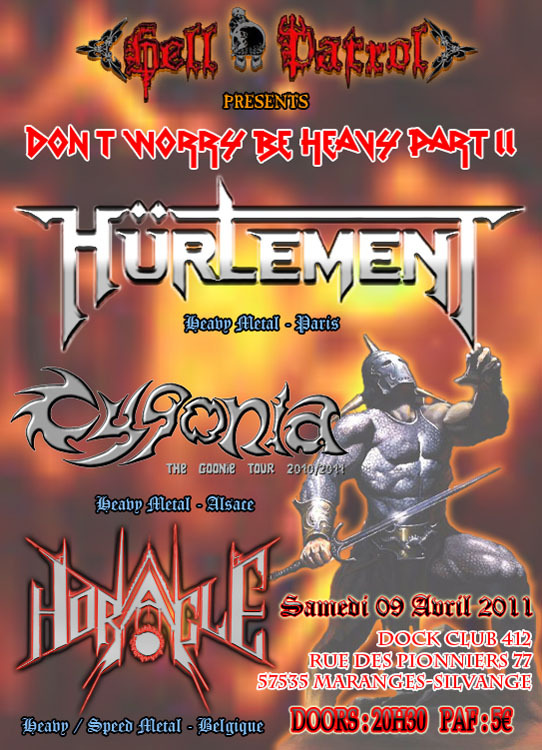 New show April 9th at the Dock Club at Maranges-Silvange (57 - France) with Cygonia and Horacle. 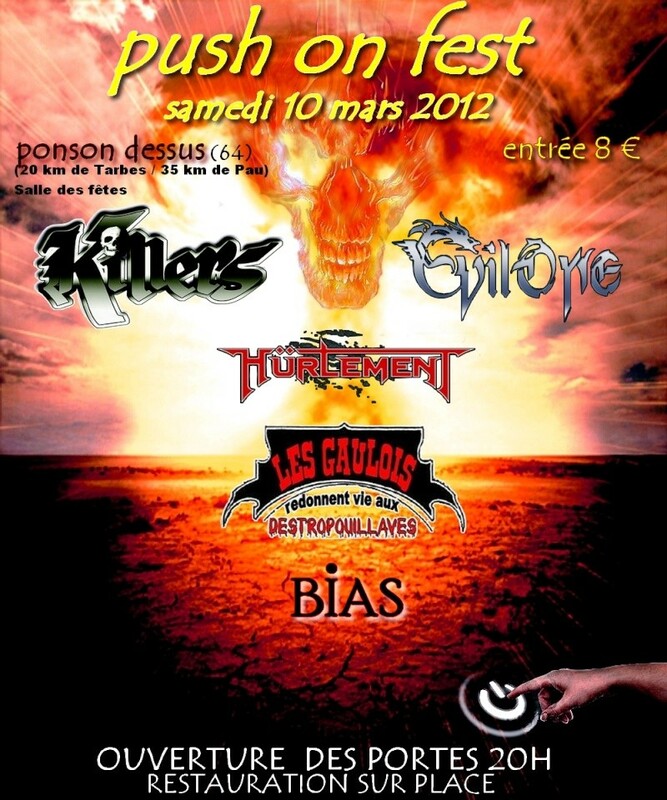 New show January 9th at La Chimère (59 - France) with Skull Fist + Children of Doom. 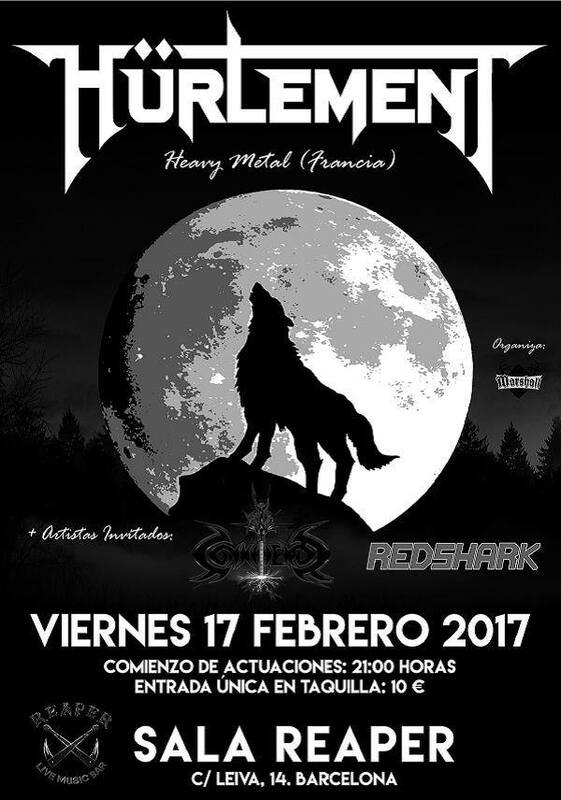 New show January 22 at Madrid (Spain) with Striker + Nadsokor. 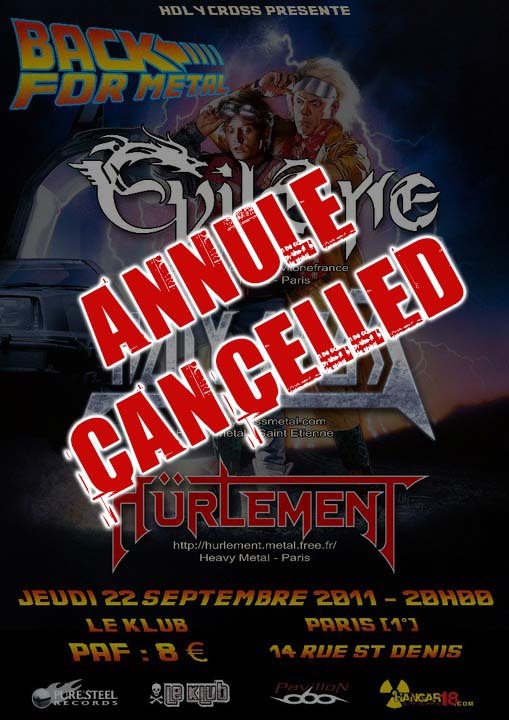 Rock en Brousse Festival 2010 is cancelled ! New show November 13 at Toreilles (66 - France) with Killers + Lonewolf + Résistance. 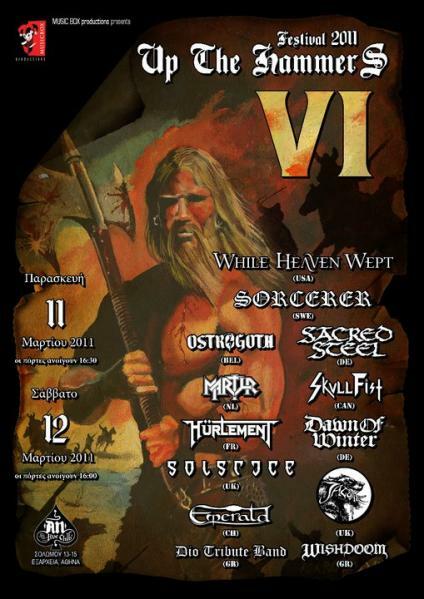 Hürlement will play at the Up the Hammers Festival VI, 11th March 2011 at Athens (Greece). 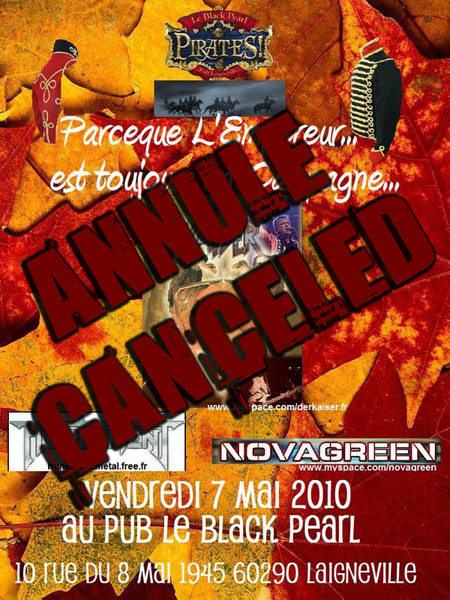 The May 7th show at the Black Pearl in Laigneville (60 - France) with Der Kaiser and Novagreen is CANCELED! 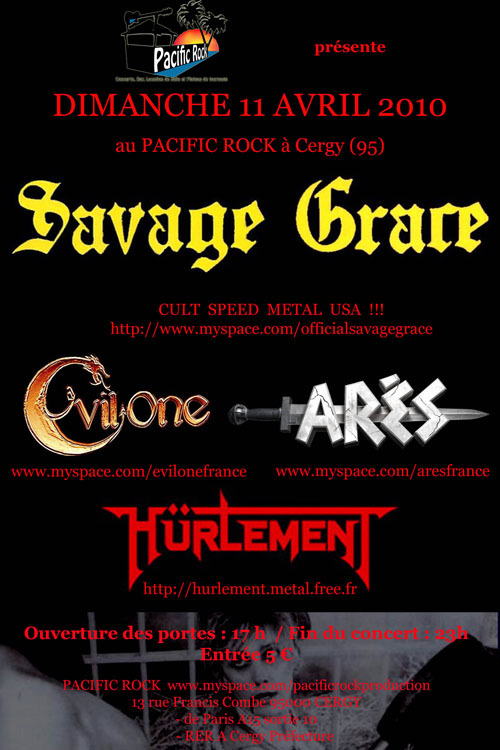 New show April 11th at the Pacific Rock in Cergy (95 - France) with Savage Grace, Evil One and Ares. 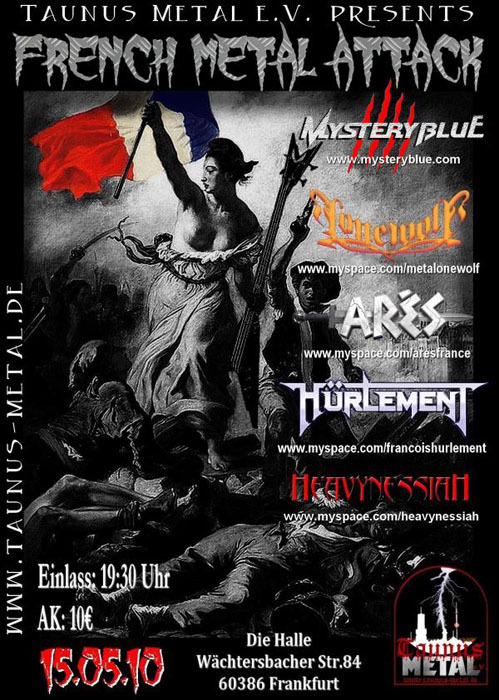 New show May 7th at the Black Pearl in Laigneville (60 - France) with Der Kaiser and Novagreen. 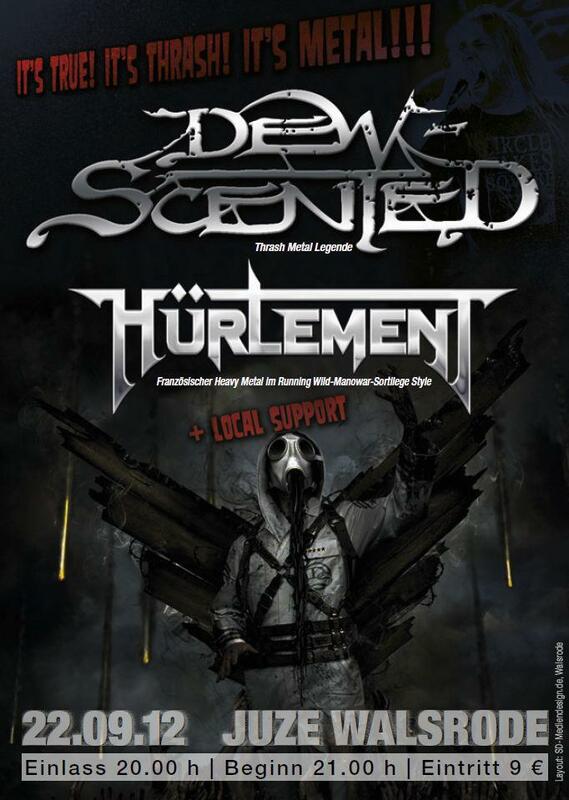 Hürlement will play at the French Metal Attack, 15th May 2010 in Die Halle at Frankfurt (Deutschland). New t-shirt is out now (XXL, XL, L, GL, GM, GS)! 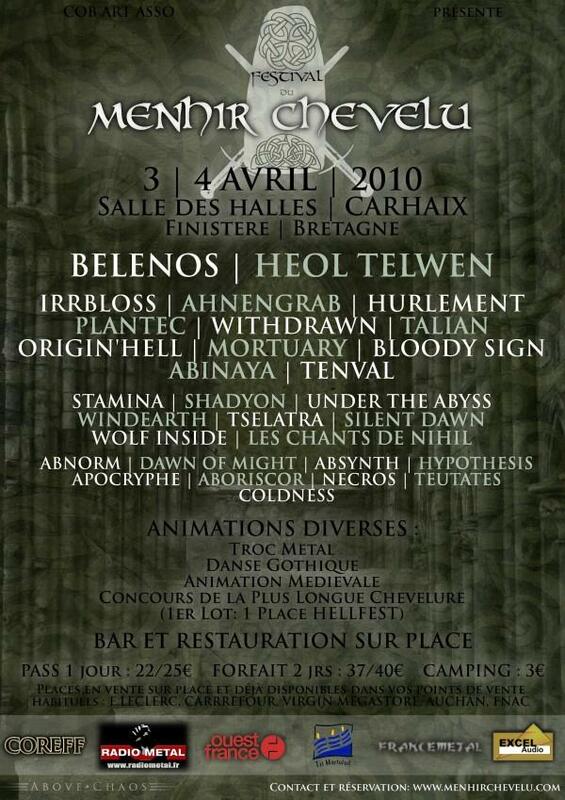 Hürlement will play at the Festival du MENHIR CHEVELU II 3rd and 4th April 2010 in Carhaix, Bretagne (Frankreich). 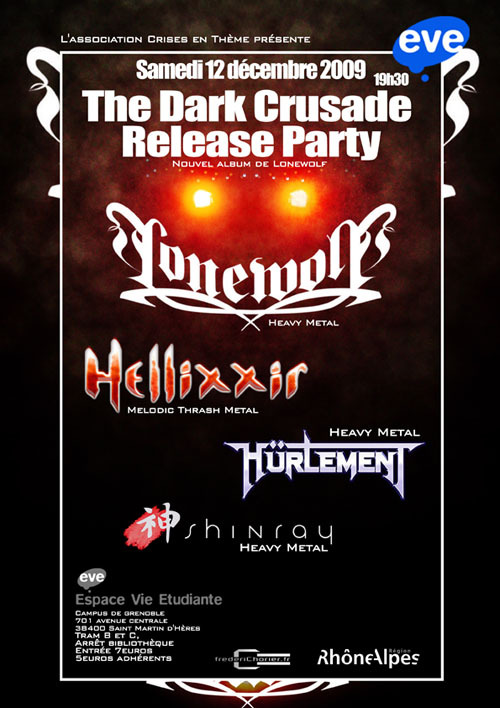 New show December 12th at l'Espace Vie Etudiante at Saint Martin d'Hères (38) with Lonewolf + Hellixxir + Shinray. Scream For Me Festival #VI (24.10.2009) photos online. Le Klub (Paris) show (20.09.2009) photos online. 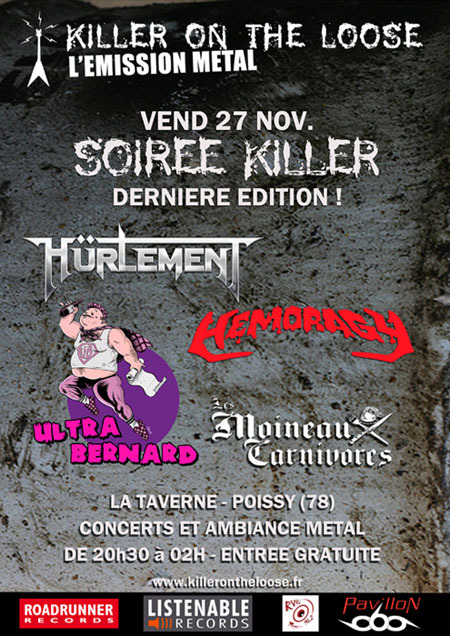 New show November 27th at La Taverne at Poissy (78) with Hemoragy + Ultra Bernard + Moineaux Carnivores. 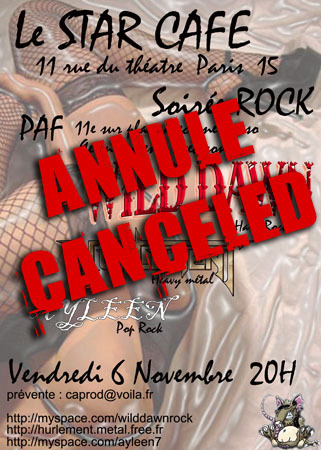 The November 6th show at the Star Café in Paris (75) with Ayleen + Wild Dawn is canceled! 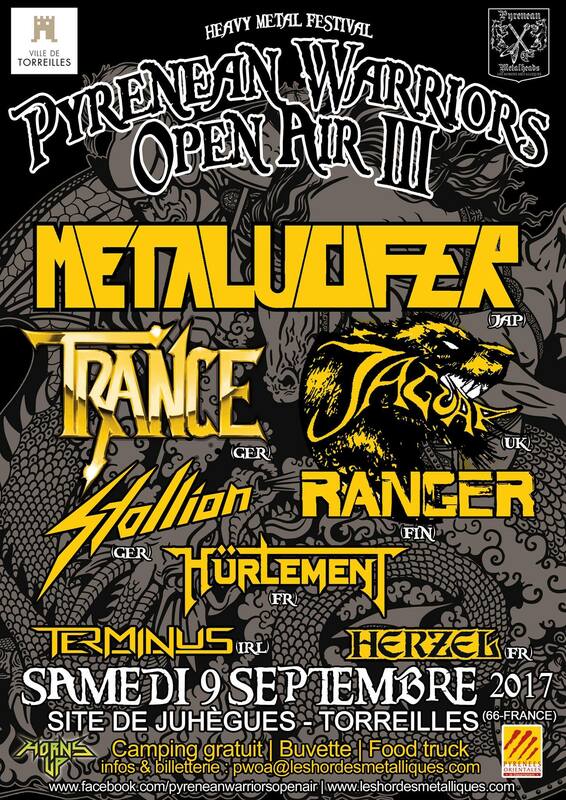 Hürlement play at the SWORDBROTHERS FESTIVAL IX 11th September 2010 in Andernach (Germany). 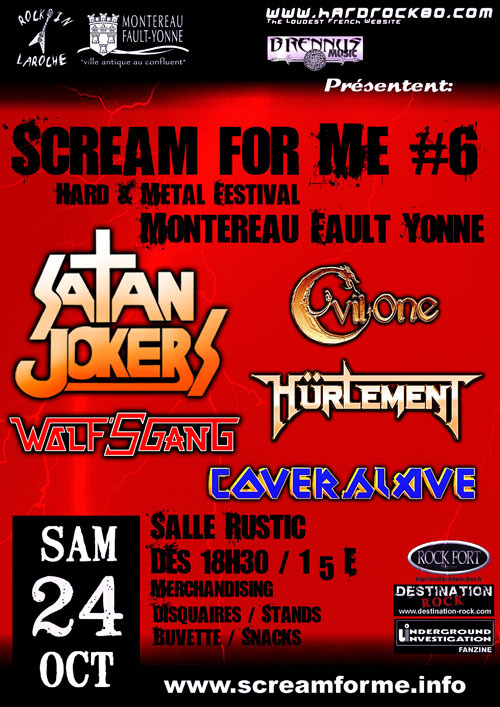 New show October 24th at la salle Rustic at Montereau Fault Yonne (77) with Wolf's Gang + Coverslave + Evil One + Satan Jokers. Our first album De Sang et d'Acier is now available on LP through Metal Coven (Germany). 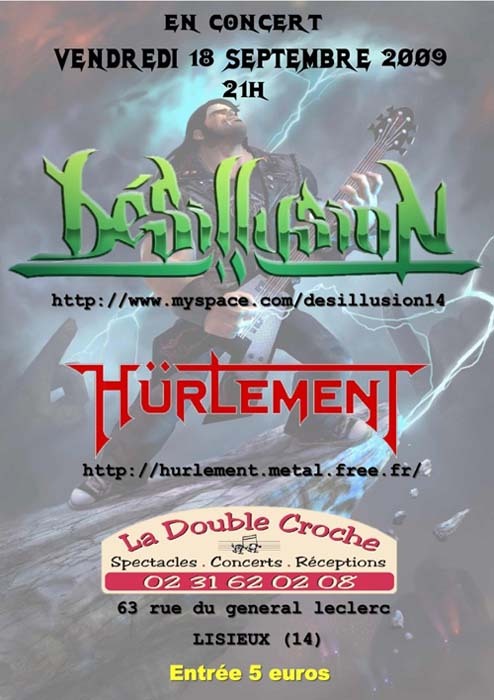 New show September 18th at la Double Croche in Lisieux (14) with Désillusion. 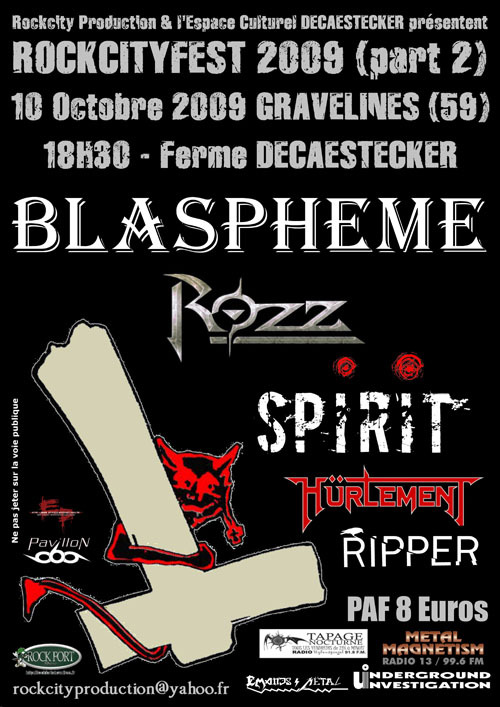 New show Oktober 10th at la Ferme Decaestecker in Gravelines (59) with Blaspheme, Rozz, Spirit and Ripper. 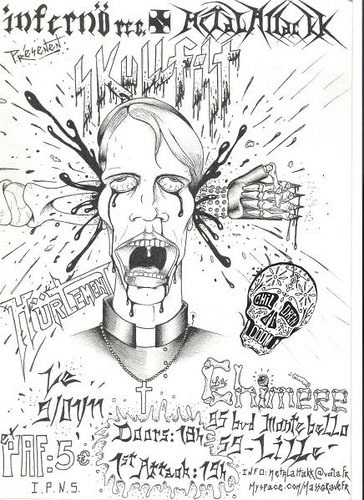 New show September 20th at le Klub in Paris (France) with Evil One, Holy Cross and Lethal Mind. Lailly en Val (45) show (31.01.2009) photos online. Le Klub (Paris) show (26.05.2009) photos online. Achères show (04.04.2009) photos online. Paris Metal France Festival III (04.01.2009) photos online. First Hürlement's patch is now available here. Our first album De Sang et d'Acier is now available on CD here and through Emanes Metal Records (France). Also soon available on LP through Metal Coven (Germany). Orléans show (28.03.2009) photos online. 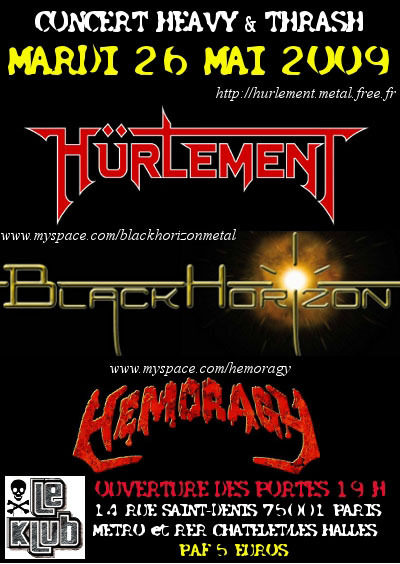 New show May 26th at le Klub in Paris (France) with Black Horizon and Hemoragy. 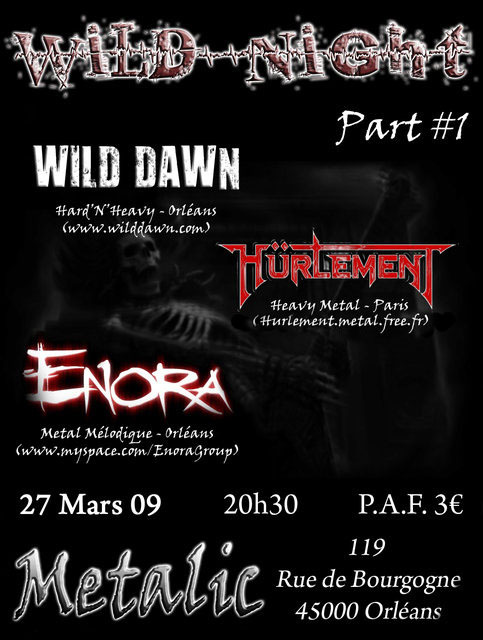 New show March 27th in Orléans (45 France) with Wild Dawn and Enora. 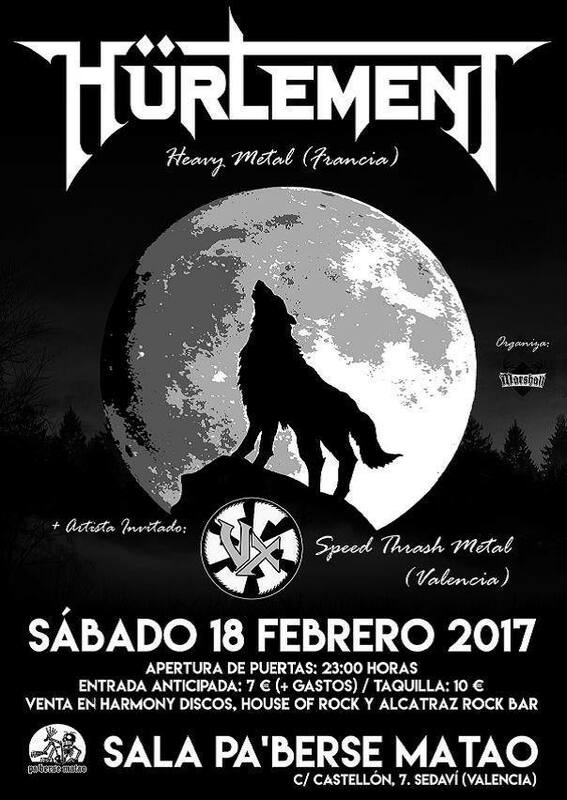 Hürlement will play at the LONG LIVE METAL !!! 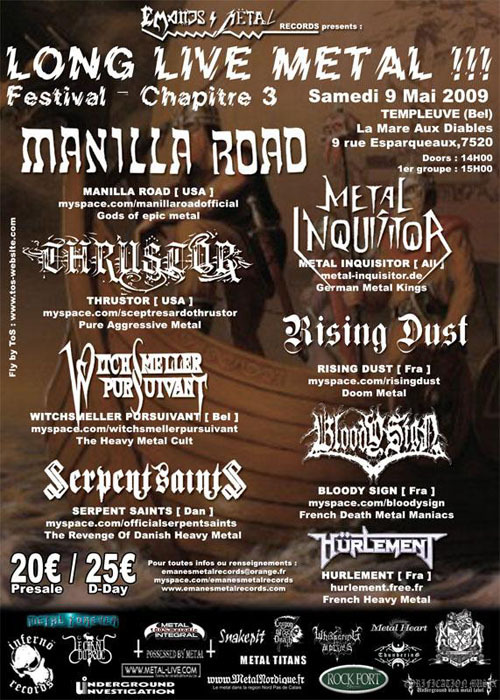 Festival - Chapter 3 May 9th in Templeuve (Belgium) with Manilla Road, Metal Inquisitor etc. New show April 4th in Achères (78 France) with ADX and Evil One. Merchandising page is now online. Our first album De Sang et d'Acier will be released on CD through Emanes Metal (France) and on LP through Metal Coven (Germany). 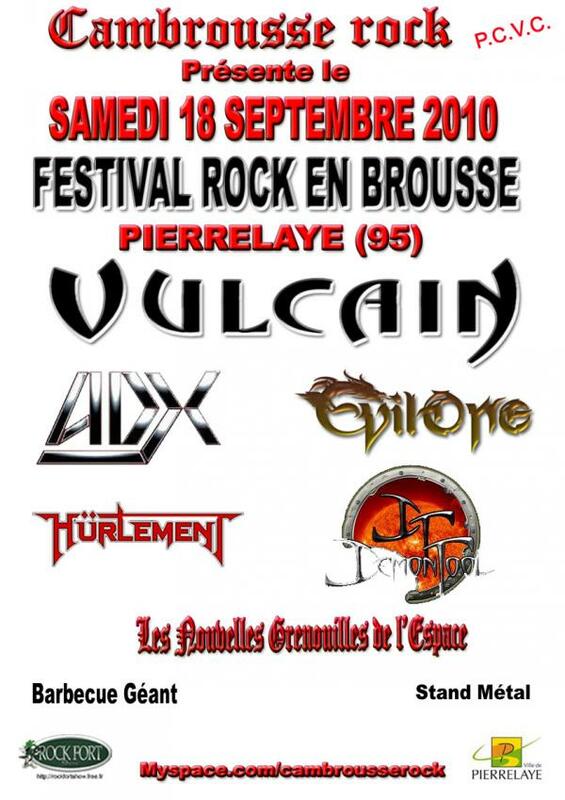 Conflans show (05.07.2008) photos online. Three tracks from our first album De Sang et d'Acier are now online. Rock Fort Show photos online. Rock Fort Show interview online. First track from our first album De Sang et d'Acier is now online. Mise en ligne du site officiel, enfin ! Concert le 31 janvier dans le 45. L'album est en cours de mixage.